2019 has been crazy busy and this is only my first newsletter of the year *blush*! I have a lot of hopeful plans for the rest of 2019, but in the meantime, I am popping into your inbox in honor of April being OT Month in the USA! 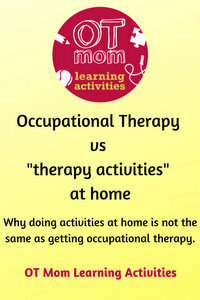 First up, here is an update on an article I wrote for OT Month a few years back – explaining why doing “therapy-type” activities at home is not a substitute for proper occupational therapy. This may sound really crazy in the light of the fact that my website focuses on activities that are inspired by my OT background, but I really am passionate about parents knowing that these activities are not a substitute for an OT evaluation and treatment. My website is meant to help you support and build your child’s skills, and not to give them therapy! Which brings me to the second reason for this newsletter! A 20% discount on my Mega Motor Bundle in honour of OT Month! Use the promo code OTMONTH2019 and click on “apply” to get your discount when the bundle is in your cart. If you know anyone who wants to boost and support their child’s gross motor and fine motor skills, then please do share the discount details with them! Just send them this newsletter so they can get it for themselves! Thanks for reading and for signing up for my newsletters! I look forward to sharing some exciting new developments with you in the months ahead!